Having launched in September 2017, you’d forgive Binance and its cryptocurrency exchange for taking a while to find their feet amid the highly competitive realm of cryptocurrency exchanges and trading platforms. Alas, age is just a number. Yes, Binance wasted little time asserting itself as one of the safest, most well-managed platforms out there for investing and trading not just Bitcoin (BTC) and Ethereum (ETH), but a host of other reputable cryptocurrencies. Let’s find out why, in this, our Binance cryptocurrency exchange review! And that’s it. Pretty simple, right? The only con to this process is that the time in between submitting all of the information and being cleared often varies. Some users receive their verified status within hours of filling out the paperwork, while others wait days and even weeks. For more info, head over to Binance’s support page. Unlike exchanges like HitBTC, Kraken, or Bitfinex, you cannot directly deposit fiat onto Binance–it is solely for crypto trading pairs. As such, deposit and withdrawal times are subject to the given cryptocurrency’s transaction speed and block times. 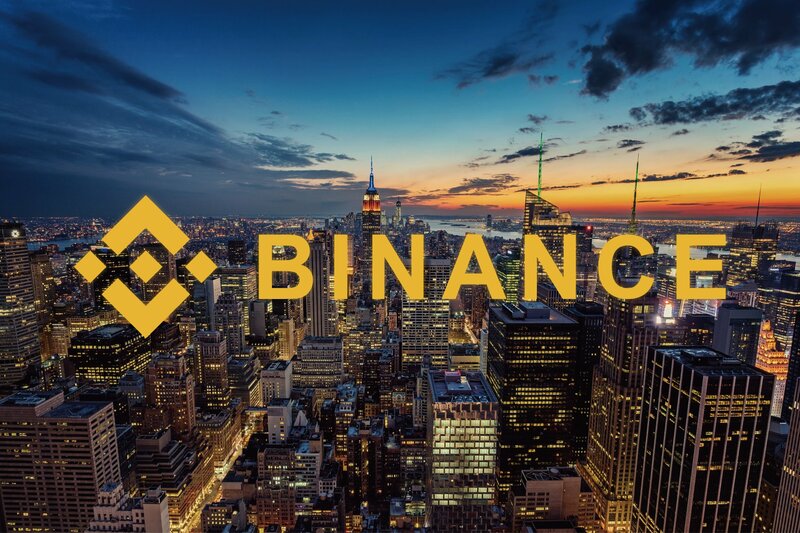 Undercutting other major cryptocurrency exchanges, the flat trading fee of 0.1% offered by Binance is one of its most appealing factors and explains how they’ve been able to attract such high trading volumes (often the highest) – despite being such a young company. Also, like many of their competitors, deposits are free. Better yet, if you use their native BNB token to pay for transaction fees, a 50% discount will be applied; making for a 0.05% trading fee. Note, this discounted amount halves annually until the fifth year where no discount is offered for using BNB. This is a default function when using Binance (but can be disabled in the account holder’s ‘User Center’). For withdrawals, this table clearly defines the minimum amount that can be withdrawn by a customer. The transaction fee associated with withdrawing each particular cryptocurrency is also stipulated. In their whitepaper, the Binance team indicates that security was of the utmost priority when creating an exchange. To ensure this security, they enabled Google two factor authentication. Google’s 2FA is mandated for anyone wishing to trade on Binance as a level two verified user. As far as I can tell from its website, Binance has no other security measures that would distinguish it from other exchanges. 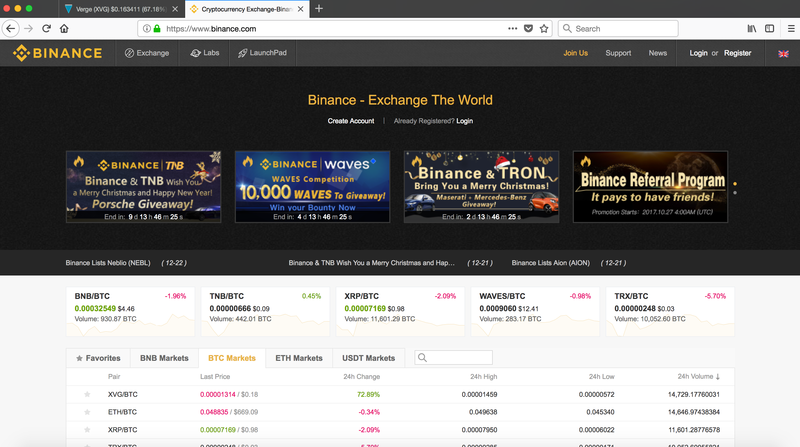 Binance has one of the cleanest user interfaces of any exchange out there. On top of its attractive look, it’s easily navigable. All of the tabs you need to access your wallet, track orders, or enter the exchange are located on a toolbar at the top of the page. The front page also includes a list of the most popular trading pairs and noteable 24/hr changes. 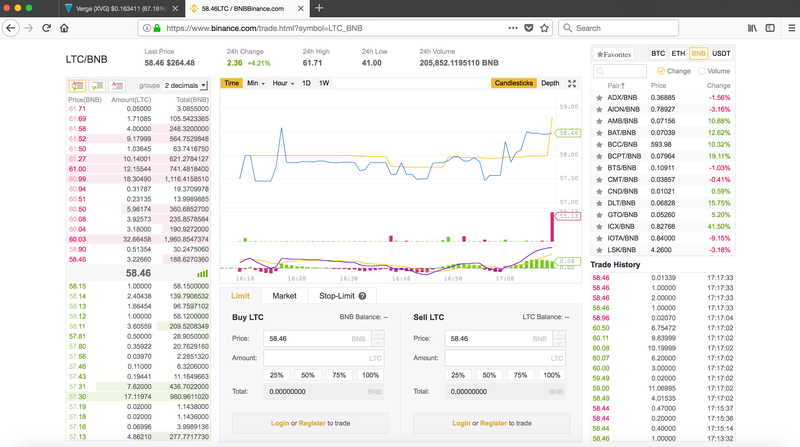 Perhaps Binance’s most notable layout features is that it offers users an advanced and basic exchange feature. The advance feature is geared more towards seasoned traders, giving them more chart tools for technical analysis and the like. For fledgling crypto enthusiasts, the basic exchange layout is straightforward and easy to use. There are a few avenues to direct your inquiries to the Binance team. You can either submit questions through their website, post on their Telegram, or hop on over to the Binance subreddit. Community members have often complained about long wait times for their inquiries, and it seems as though Binance’s customer support is one of the only real negatives the exchange has going for it. Binance recently implemented a stop-limit option for sell and buy orders. Many community members rejoiced at the news, as this was one area in which Binance paled in comparison to exchanges like Bitrrex and Kraken. The exchange also sports its own currency, Binance coin (BNB). BNB has markets with every conceivable coin on the Binance platform, making it an effective skeleton key to moving funds from currency to currency on the exchange. Trading fees are also halved when using BNB, so instead of paying 0.1%, you’d only pay 0.05%. Binance also has multilingual support. The exchange is available in English, Chinese, Korean, Japanese, German, Spanish, Russian, and French. Finally, the exchange offers a mobile app. Binance offers one of cleanest exchange experiences out there. Between its low fees, quick processing times, and user-friendly versatility, it’s definitely worth trying out. Amazingly, it’s not even a year old and it’s the fastest growing exchange on the market. We don’t expect this growth to slow anytime soon, as Binance will continue to supply more trading pairs in the future. But hey, if you don’t want to take our word for it, perhaps the exchange’s booming growth will speak for itself. Here at CryptoCoinSpy, we believe that when it comes your money and anything related to the highly unregulated crypto ecosystem – be it investing in a cryptocurrency or sending funds to a crypto exchange – it’s our priority to shine the light on exactly who is behind the entity you’re thinking of entrusting your hard-earned funds with. And so, let’s identify some key team members from Binance. Boding well for the crypto exchange giant is the fact its CEO and co-founder, Zhao Changpeng, stands as one of the most respected people in the entire cryptosphere. Known commonly as ‘CZ’ among the crypto community, he is refreshingly transparent; updating his Twitter account most days. Before co-founding Binance in July 2017, Changpeng held high-end positions at well-established enterprises; dating back to 2001. These included Bloomberg Tradebook (Head of Futures Development), Fusion Systems Ltd (Co-Founder), Blockchain.info (Head of Technology), OKCoin (Co-Founder & CTO) and BijieTech (CEO & Founder). In fact, the latter was the company that created the Binance cryptocurrency exchange. Other senior-ranking staff include Yi He (Co-Founder), Roger Wang (CTO), James Hofbauer (Chief Architect), Paul Jankunas (VP of Engineering), Allan Yan (Product Director), Ling Zhang (Director of Binance Labs), and Sunny Li (Operations Director). Most of these experienced individuals are profiled in the Binance whitepaper (pg. 10-13).